Blueberries are the epitome of summer for me. I spent every summer growing up in Finland with my grandmother picking wild blueberries. There is nothing like blueberries that grow in the forest. 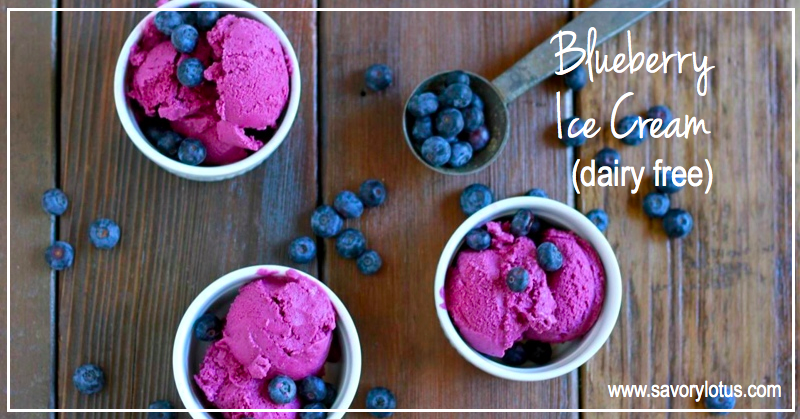 This is my ode to summertime in the land of the midnight sun: Dairy Free Blueberry Ice Cream. I can still remember the huge bucketfuls of blueberries that my grandmother would come back from the forest with. I can still taste the bowls of fresh blueberries and milk with just a titch of sugar sprinkled over that she used to serve all of us grandchildren. Pure heaven! Food can be such a nostalgic thing. I can’t eat fresh berries with out thinking of my lovely long summers in Finland. Raspberries that were big enough to fit over each finger. Lingonberries growing on the side of the house. Tiny wild strawberries eaten on the side of the road. And of course, my favorite, the blueberries. There is something about the clean air and soil and the cool midnight sun nights that makes Finnish berries the best that you have ever tasted. I’m in love. Sweet flavors and healthy vitamins from the fresh blueberries. Tons of good for you fats from the coconut milk. A titch of added sweetness from the maple syrup. Takes me back to the heavenly feeling as a child, not a worry in the world, eating fresh berries from the forest. I was actually blown away at how creamy and rich this dairy free ice cream is. So simple! 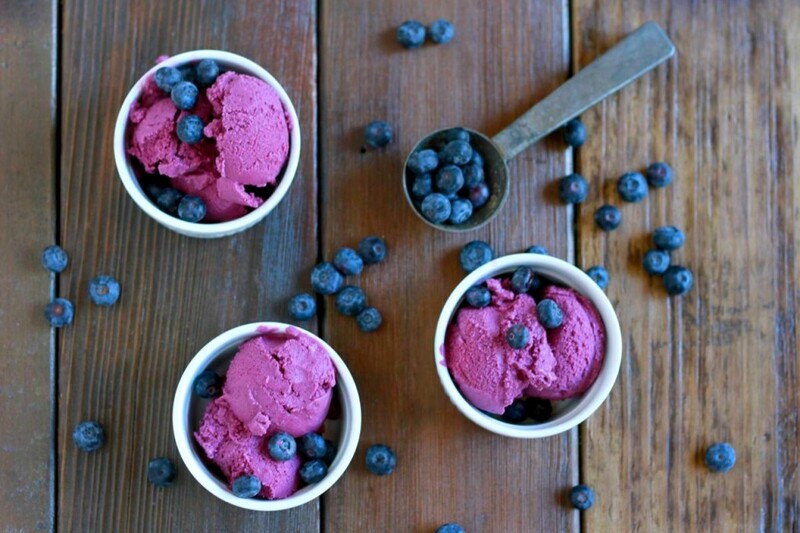 You will need as ice cream maker for this blueberry ice cream recipe. THIS is the one that I have, and I absolutely love it. I highly recommend using fresh blueberries to get the best flavor. I used maple syrup for this recipe but you can experiment with coconut sugar, honey or even dates. I like to add a titch of grass fed gelatin to my ice creams for added texture and creaminess. This is totally optional, but I really like the end result. I hope you enjoy it. Happy Summer! Bring blueberries, maple syrup, and salt to a boil in a medium pot. Turn down heat a bit and simmer softly for 3-4 minutes, until berries begin to pop open. Remove from heat and allow to cool slightly. For optional gelatin: Combine 1 TBS of gelatin with 1/4 cup boiling water and whisk until gelatin is completely dissolved. 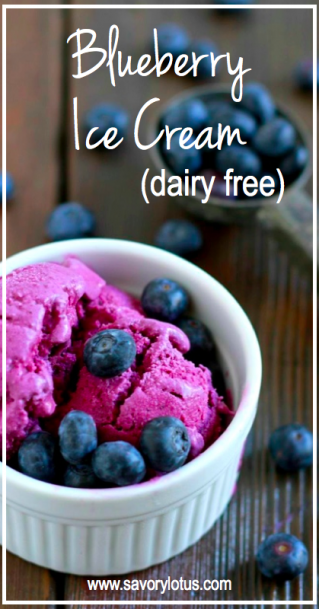 Add blueberries mixture, coconut milk, vanilla extract, and optional gelatin to blender. Process until creamy smooth. Place into fridge until very cold, overnight is best. 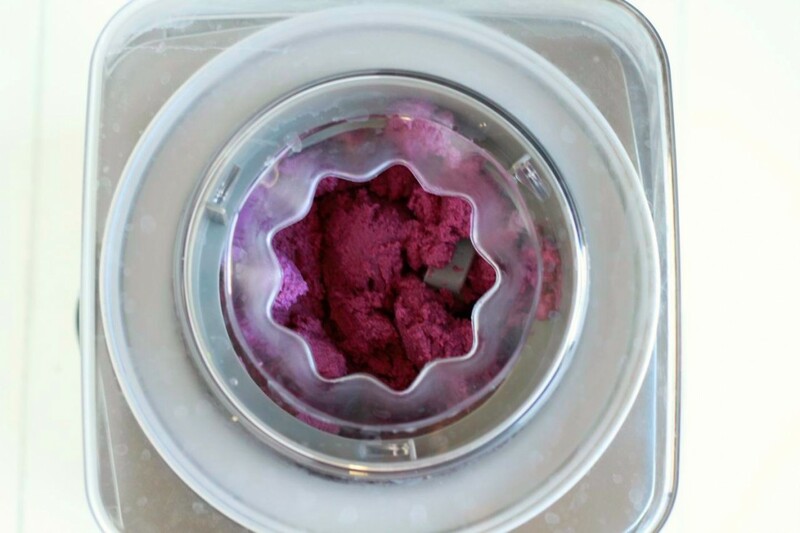 Pour into ice cream maker (like this one) and process according to manufacturer’s instructions. I’ve made this ice cream twice. It is absolutely delicious!! However, mine is NOTHING like the color of yours. My blueberries were fresh and perfectly ripe. The color of my ice cream was dark purple – not a hint of pink. 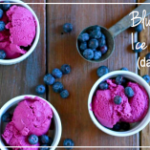 I initially tried the recipe to make this beautiful pink ice cream for my granddaughters. Can you help me with this? Thanks. Sounds delicious!!! How much ice cream does this recipe make? Thanks! Hi there! This looks lovely – would it still work if I didn’t blend the blueberries but rather folded them in instead? Would this work without an icecream maker? It will not be the same consistency. Sorry!